As you work with a skein of yarn, you have the choice of pulling yarn off the skein from the outside of the skein or from the center of the skein. While both methods work, pulling yarn from inside the skein keeps the skein still, making it easier to use the yarn. The challenge to pulling yarn from the center of the skein lies in finding the end of the yarn to start pulling. Often this yarn tail lays buried deep within the skein. Find the end of a yarn inside the ball to begin a yarn project. Hold the yarn ball in both hands and find the holes on each opposite end. Insert your right index finger into the right-side hole and your left index finger into the left-side hole. Push your fingers into the yarn skein until they touch each other inside the yarn ball. 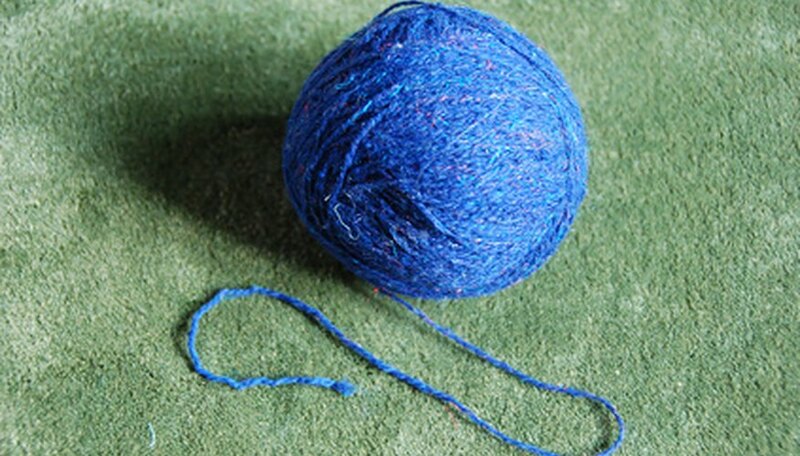 Loop your right index finger around a small wad of yarn inside the yarn ball. The end of the yarn ball is likely within this wad of yarn. Pull the wad of yarn gently out the right-side hole of the yarn ball with your index finger and look at it carefully. Shake the wad gently to separate the end of the yarn. Do not pull on the yarn wad because you may create a knot. Instead, try to see the yarn end inside the wad of yarn and gently pull it out. Push the wad of yarn back inside the yarn ball, leaving the yarn end outside of the ball. Pull the yarn end gently to begin using the yarn. How to Make the Game "Pick a Color, Pick a Number"